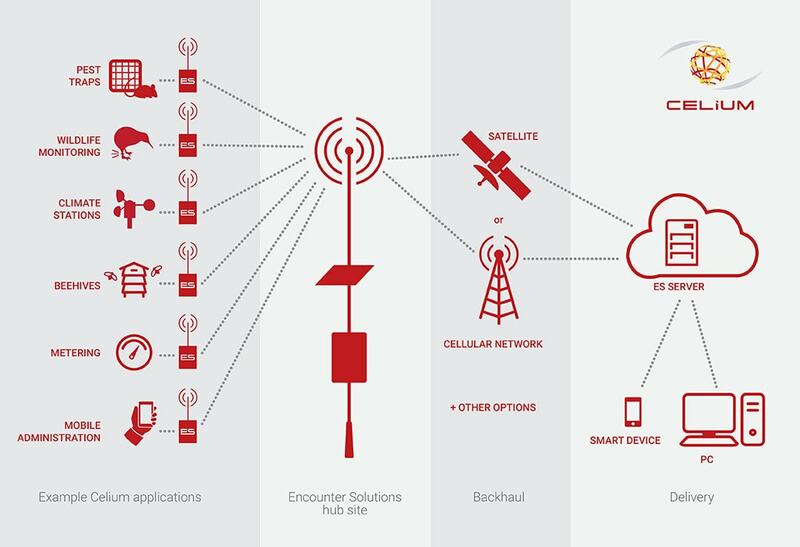 Celium is a unique low power wireless network designed with wide-scale rugged management applications in mind. Celium consists of an array of communication devices, called Nodes, which are equipped with sensors. The sensors are designed to monitor parameters such as the status of a pest control trap, which the Nodes then communicate to a base station called a Hub. Celium Hubs then transmit the data via satellite or a cellular network to secure cloud servers. After processing, the data is delivered to users via the Celium Web Portal, Email Notifications and Mobile Applications running on devices such as smartphones and tablets. 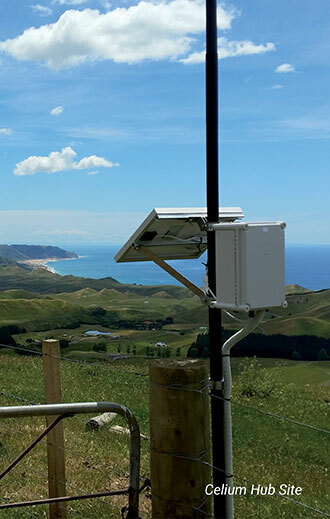 Celium is ideal for connecting, remotely monitoring and controlling numerous devices in rural and remote landscapes. The applications are myriad and include such things as pest animal traps, wildlife monitoring, climate/agriculture instrumentation, metering, security systems and infrastructure monitoring. Celium brings the Internet of Things to rural and remote landscapes, thereby enabling governments, landowners, rural businesses, and communities to optimise the way they manage natural resources. Long Range – Designed for deployment over large areas of rural and remote land, even in rugged conditions, Celium can send data over very long distances. Encounter Solutions has validated communications over distances in excess of 50 kilometres with its standard Nodes, see the right-hand image for an appreciation of the scale. This is more than double the distance described as ‘long-range’ by other Low Power Radio Wide Area Network (LoRaWAN) systems that operate at radio frequencies above 800 MHz. In addition to communicating over long distances, Celium also delivers remarkable non-line-of-sight performance, across hilly topography and through dense, wet vegetation as illustrated in the image below. Celium’s range in line-of-sight conditions has been recorded at over 50 kilometres. 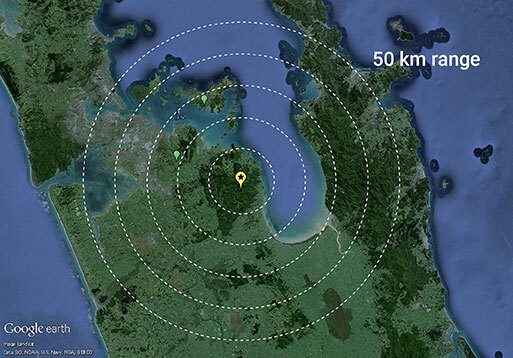 This example shows a Celium deployment in Auckland, New Zealand, with range rings out to 50 kilometres for an appreciation of scale. The above image shows a successful Celium deployment communicating in non line-of-sight conditions over steep and forested topography. The indicated Node is located 2.4 kilometres away from the Hub site. This example is from Mahia, New Zealand. Low Power – Celium requires very little power to run and complex high power radio equipment is not needed. This makes Celium equipment readily portable, fast to deploy and enables sensor Nodes to operate on inexpensive AA batteries for several years. Battery lifetime is influenced by a range of factors including the frequency and duration of the transmissions, the amount of data to be sent and the quality of service. Due to Celium’s excellent long-range performance, simple power efficient network configurations can be used to extract long operational lifetimes from batteries and an 8- year battery life is possible. Reduced Cost – Celium is capable of delivering significant benefit-to-cost ratios to labour intensive operations and research based on real-world data indicates that wireless monitoring technology like Celium could save up to 50-70%* of these operational costs. For example, by simply only checking the traps that are sprung overhauls the cost of pest control. Analysis of trapping programme data from New Zealand Regional Councils that Encounters Solutions is already working with suggests that these operational savings may even exceed 80% in some circumstances, or the scope of trapping operations could be doubled for the same time and cost. Flexible – Designed to be flexible and light-weight, Celium Hubs have been installed on, and in buildings, on fence posts and even in trees. Celium Nodes can be connected to and monitor many different devices and a wide variety of assets. Celium Nodes even have a built-in keypad for on-site management and diagnosis. Celium works indoors and outside, in urban centres and on islands. Proven – Celium has already been installed on islands, in forests, in the desert, around lakes and wetlands, in coastal areas, over steep topography, amongst stock on productive farmland and in urban areas. As at May 2018, Celium networks have transmitted over 190,000 messages on behalf of assets managed by 5 New Zealand Regional Councils, the New Zealand Department of Conservation and the Wild Dog Management Program in Australia. * Jones C, Warburton B, Carver J, Carver D 2015. Potential applications of wireless sensor networks for wildlife trapping and monitoring programs. Wildlife Society Bulletin 39: 341–348. Celium Hubs are responsible for monitoring and administering the Celium Nodes within their jurisdictions. Hubs on-forward acquired data to Celium Cloud Servers via satellite or cellular network. Hubs are lightweight and designed so they can be carried and installed by one person. Hub batteries are kept charged using solar energy. Hubs are equipped with both wired and Bluetooth wireless connectivity for administration and data download purposes. Celium Nodes are wireless communication devices which are equipped with or connected to, sensors. Custom designed Nodes run on AA batteries, are able to perform a wide variety of functions and monitor a range of different parameters and assets. High-performance devices, Nodes are tough enough to withstand demanding conditions. Nodes have a built-in low power keypad to allow standalone, in-field management and diagnosis.